Thanks for sharing. The article was sent. As if Erin were not a charming enough creature, she also happens to have one of the most wonderful food jobs out there, working on Flying Pigs Farm and coordinating a groundbreaking food education program: Farm Camp. Erin will be leaving her post soon (and the farm is looking for a FARM MANAGER, too - see the job opening here), in order to study Food Policy at the New School, but her agricultural days are far from over. We'll be anticipating her future contributions to shaping the way we all eat. What attracted you to a good food job? It was the Asparagus! I remember picking my first stalk in the spring of 2001. The bold green spear shot straight out of the earth like a little tree. It was from a local farm, delicious, tender, and vegetal and it felt like the food of a superhero I wanted to be: the flavor compelled action. At the time, I had just finished college with a degree in Creative Writing and thought I might go to law school. I was working for Zingerman's Deli, a renowned Midwest food destination. I took asparagus out of the kitchen by the handful and gave these little magic wands to unassuming sandwich seekers; they were my weapon of choice. I turned our staff into an asparagus posse, unleashed to engage the taste buds of Ann Arbor and it changed me. I spent the next eight years dissecting our nation's food system from the perch of retailer, cook, and farmer. Each profession presented new obstacles and pushed me towards the next. In each arena, I worked to identify the skills that seemed most essential to successfully advocating for real change-that drive to grow my impact has led me to Milano, The New School's program in Urban Policy Analysis and Management. I see policy as the next logical step; my newest magic wand. It will allow me to continue my pursuit of a more equitable, sustainable, and just food system by providing me with tools to leverage my real-world experiences. It will allow me to influence lasting and large-scale changes. How did your previous work or life experience prepare you for a good food job? I am the oldest of six and was raised in my father's tiny hometown; he is one of eleven. My father runs a small chiropractic practice and, along with my brothers, is an avid hunter and sportsman. Throughout my childhood our dinner table was filled with the spoils of their hunts: venison in the fall, rabbit in the winter, and Great Lakes salmon throughout the summer. My mother cooked everything from scratch: hot breakfast every morning, family dinner every night, and even the bread, for the sandwiches in my bagged lunch. I was surprised to learn, upon starting college, that this wasn't the way my friends grew up eating. A connection to the land and the seasons is part of my personal history and it has become a driving force in my life. What advice do you have for others in search of a good food job? 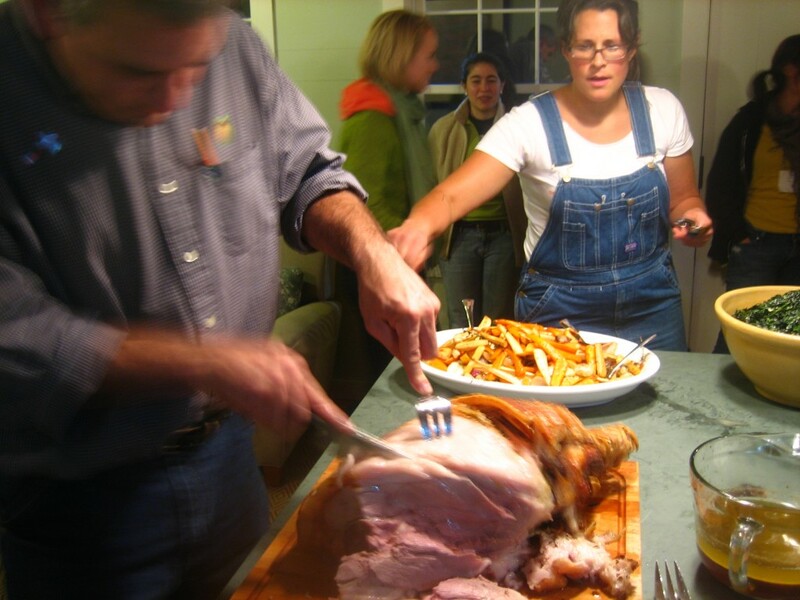 A good food job is a "REAL JOB," treat it like one-have a vision and come prepared. If you approach your work like it's a career you'll have a much easier time deciding what jobs make sense for you. There is a lot out there so take some time to think about what you want your life to look like and what specific skills you'll need. Be an active and engaged student of your craft. Show up for events, sign up for the listserves of organizations/businesses you admire, read, eat, advocate, step away from the computer and get involved. You're much more likely to get a job you love through personal experience or recommendations than craigslist and the internet. Editorial Note: until Good Food Jobs comes along; but we STILL want you to get out there. Our website should be a tool to motivate you to get out there; it's a facilitator to your outside efforts, rather than a substitute! If you could be compensated for your work with something other than money, what would it be? Meaningful experiences that add to my skill set and support a sustainable regional food economy. The Cost of Opportunity: One Man’s Story of Migrant Work in the U.S.